When we were on Croatia that one time, I didn't like olives. What a bummer! There were olives everywhere and I bet they were so delicious. Now I just eat them off the olive bar. Oh well. Anyway, this is one of the easiest dinners you can make. Chop up some things, put some chicken on top, and 45 minutes late you have dinner. Yum! Serve with some garlic bread or over pasta or rice or just eat it like this, out of a bowl, like we do because I keep forgetting to make something to go with it. Preheat the oven to 425. Chop up your olive bar stuff, and toss together those things with onions, garlic (except the one mashed clove), broccoli and whatever vegetables you have around. Mash together the herbs you're using (eyeball it, I used about 1/2 t of each) with the remaining garlic and a little olive oil, about a tablespoon. 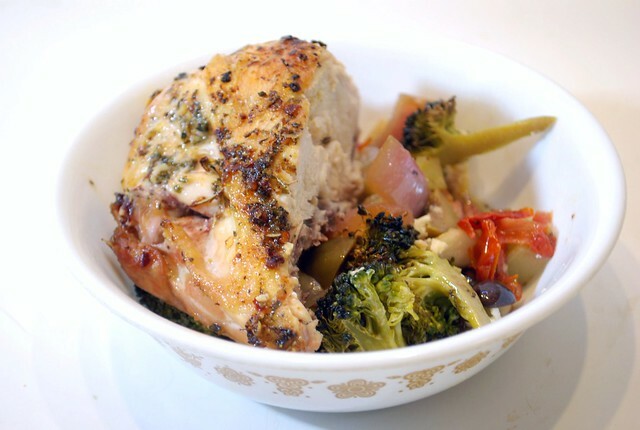 Smear this all over the chicken, set on top of the veggies, and bake 35-45 minutes. It's done when you poke the chicken with a fork and the juices run clear. 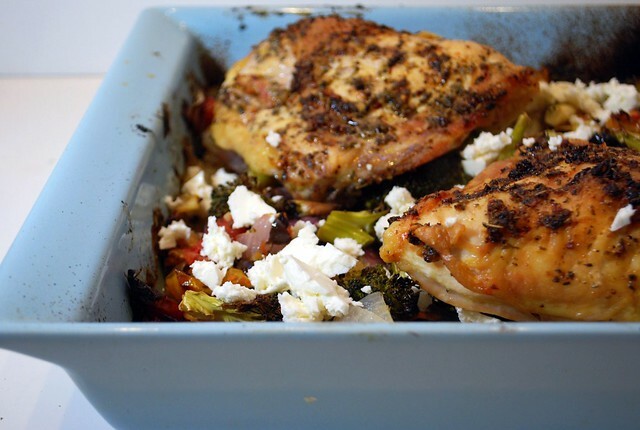 When the chicken is done, crumble the feta over the top and serve.